4-Word Review: Where fantasy meets silliness. 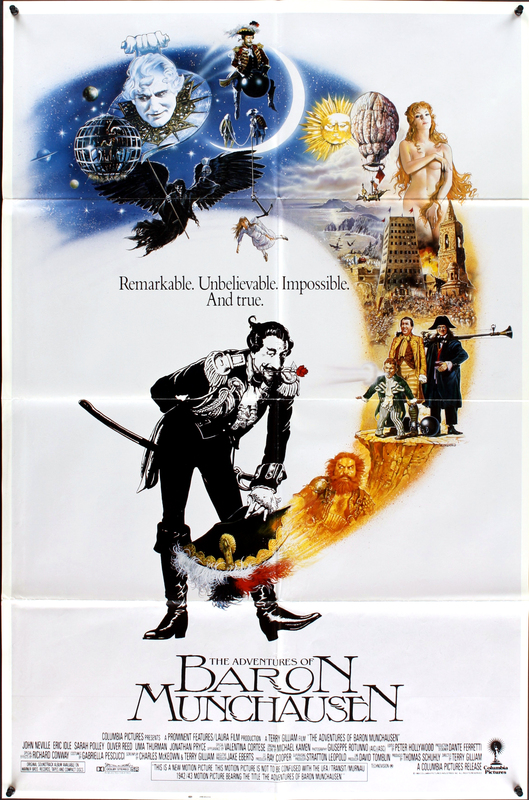 A touring stage company in some unnamed European city during the 18th century is putting on a production of fictional character Baron Munchausen’s fanciful life when it gets interrupted by an elderly man (John Neville) insisting that he is the real Baron and who then takes center stage to narrate his adventures from his perspective. Unfortunately an army of Turks are also invading the city at the same time, which forces him to escape via a hot air balloon made of women’s undergarments. With him is a young stowaway named Sally (Sarah Polley) and together they try to round up a group of elite men with unique abilities, which they will use to team up against the Turks and hopefully win back the city while also meeting many odd characters and going through a myriad of zany, mystical scenarios. The film’s dazzling production ran 24 million over budget only to then bomb at the box office but the intoxicating special effects almost make it worth it while it also remains kid friendly with action sequences that are pleasantly cartoonish and innuendos that are too subtle for them to catch. The balloon made of women’s underwear is great and as well as watching the trio get swallowed up by a giant sea monster whose head resembles that of an island. I also liked the angel of death scenes and wished those had been played up more. Even the little things like seeing a tiny grain of sand slither its way down the thin glass tube of an hourglass is fun. The colorful sets are dazzling and the whole thing gets saturated with a visual flair that is quite impressive. Although she has complained in subsequent interviews about her experience working in this film and dealing with director Terry Gilliam Polley’s presence adds a lot with a performance that is completely on-target the whole way. She’s one of those child characters that is cute without it being forced, which is a major feat in itself. Robin Williams is hilarious as a giant floating head in a part that was intended for Sean Connery who I don’t think would have done it half as well. I also got a real kick out of Oliver Reed as a jealous god and Uma Thurman as his stunning wife Venus, which is technically her film debut, but due to budget delays this came out after two of her other films had already released. The only real complaint about the movie is the plot or lack thereof. I loved the creativity, but after a while it starts to become dizzying and senseless. 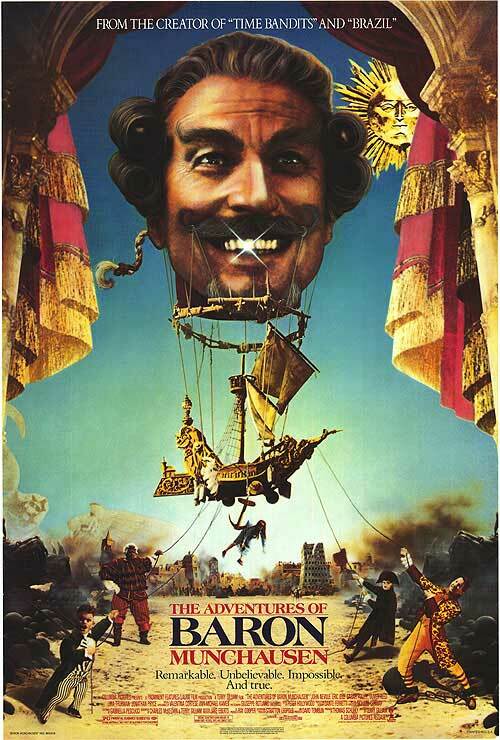 Gilliam’s other films like Time Bandits, which like this movie is part of his trilogy of imagination, at least had a discernable story that sucked you in and in Brazil it made great satirical jabs at modern day society, but here we get none of that. It becomes silly and surreal for no reason, which when factored in with its giant production cost and manpower turns it into a supremely wasted effort. Don’t get me wrong it’s amusing and engaging enough to be entertaining, but when it’s all over it is also quite forgettable. This entry was posted in 80's Movies, Action/Adventure, Campy Comedy, Movies Based on Novels, Movies for the Whole Family, Surreal/Fantasy and tagged Entertainment, John Neville, Movies, Oliver Reed, Review, Robin Williams, Sarah Polley, Terry Giliam, Uma Thurman. Bookmark the permalink.